With the HELIX 7 series, Humminbird brings to the table several brand new fish finders. As the name of the series suggests, these units feature a 7″ display. They’re also HD capable, and depending on the unit, each one has its share of useful technologies. The HELIX 7 SI GPS is one of the most inclusive of the series, offering Side Imaging and Down Imaging sonar, along with the standard DualBeam Plus. It’s also a chartplotter, featuring one of the finest GPS systems. XHS 9 HDSI 180 T. The answer is “yes”, however, the unit doesn’t support the elements from the 800 kHz in this transducer. Therefore you will be able to use just the 200/83/455 frequencies. But, with the XHS transducer, this unit will provide slightly superior quality imaging for the 455 kHz, DI and SI. The transducer has a built-in temperature probe, which enables the head unit to indicate water temperature. The unit does not offer a Temperature Graph function. It does have though a temperature alarm function. Also, the transducer comes with 20′ (6 m) of cable. The XNT 9 SI 180 T transducer supports all types of sonar technologies that the display unit provides: standard sonar, Down Imaging, and Side Imaging. For the standard sonar, it can operate at 200 kHz, with a narrow, more focused beam of 20°, while at 83 kHz it has a beam of 60°. Both beams are conical shaped. Since the unit supports DualBeam Plus sonar, both the views offered by the 200 kHz and 83 kHz beams can be observed in split screen, blended together or separately. The Side Imaging sonar, operates at 455 kHz, working with two side beams, 84° each, covering a surface of 240 ft. on each side, 480 ft overall. As for the Down Imaging, this unit actually uses the Side Imaging beams to create one beam for the Down Imaging. This beam is fan-shaped, razor-thin (about 2°) fore to aft, and wide from side-to-side. The side-to-side width of the DI beam can be modified, choosing from three settings, Narrow, Medium and Wide, depending on how much information you would like to see on screen. Evidently, both SI and DI sonar technologies offer sharp imaging, with photo-like clarity, making it much easier to see the shape of structure, bottom, vegetation, and distinguish between structure and fish. When it comes to depth capability, standard sonar can go up to 1500 ft., while DI and SI are reliable for depths up to 100 ft.
Several other notable sonar-related features provided by this Humminbird fish finder are FishID+, SwitchFire, Circular Flasher view and Sonar Recording. The selective FishID+ sonar view gives fish icons to sonar returns considered fish by the unit. It’s a great feature to have if you’re new to sonar, and haven’t mastered the standard view yet. Note that not all the returns displayed as fish will be fish though. SwitchFire is a function also used by the standard sonar view, giving you the possibility to alternate between full sonar information and a fully decluttered mode. The Circular Flasher is a sonar mode best to use on ice or when down dropping. And finally, Sonar Recording gives you the possibility to record your sonar feed, or quickly scroll through the recent sonar to view a specific spot you’ve just passed over. This can save time and fuel if you want to review a specific spot, as you won’t need to turn the boat around and pass over it once more. Sonar Recording, as well as Screen Snaposhot functions, require a MicroSD data card, in order to be able to save the snapshots or recorded sonar. This unit features an internal Precision GPS receiver, which uses WAAS for correction, offering fast position fixes with an accuracy within 2.5. When it comes to tracks, routes, and waypoints, this HELIX unit has these functions covered. It can store up to 2,500 waypoints, with 45 routes (50 wp each). There’s also a track plotting function, this unit being able to record your course in a breadcrumb manner, being able to save up to 50 distinctive tracks (20,000 points each). The unit also measures the boat’s speed via GPS. The cartography built-in the HELIX 7 SI GPS is the standard UniMap. This mapping package doesn’t offer super detail, but it’s nonetheless useful. It covers the contiguous US coastline and inland lakes at 30 m / pixel. However, the unit is compatible with various other mapping packs, such as LakeMaster, AutoChart, AutoChart Pro, Humminbird Mapping and Navionics Gold/HotMaps. All these map packs are available in MicroSD format. Several other navigation functions to be mentioned about this Humminbird unit are Drift Alarm and Off Course Alarm. The first one gives you the possibility to select a perimeter for your anchored boat, and in case it will drift out of that perimeter, the alarm will sound. The Off Course Alarm is pretty much similar to the previously mentioned function, only the alarm will sound if you divert from your setup course. There’s also a Bird’s Eye View function which gives you a 3D view of your location, with a point of view above and behind the boat. This evidently enhances the situational awareness. As terminology suggests, the HELIX 7 units all feature a 7-inch diagonal display. It’s a full-color unit, with a display color grayscale of 256 colors. It’s also HD ready, with a pixel matrix of 480V x 800H. The display is LED backlit, in order to offer superior readability. The display unit has an IP67 rating, meaning that it can withstand incidental water exposure, and it’s also dust tight. The unit features on MicroSD card slot for additional mapping or sonar recording. The internal software is upgradable, and upgrades are done also via sd card. It does not support NMEA 2000, but does, however, have an NMEA 0183 port. Included with this unit there’s a gimbal, tilt-and-swivel mount, but there’s also the option for an in-dash mount. If what we’ve covered so far pretty much sums up the pluses of this Humminbird HELIX unit, this section of the post will focus on the few minuses. First of all, the unit only has on MicroSD card slot. Therefore, if you want to record sonar but also have a Navionics maps card, you will have to swap cards, and only use one at the time. And second of all, the unit does not have an NMEA 2000 port, which would have been expected from a brand new unit model. 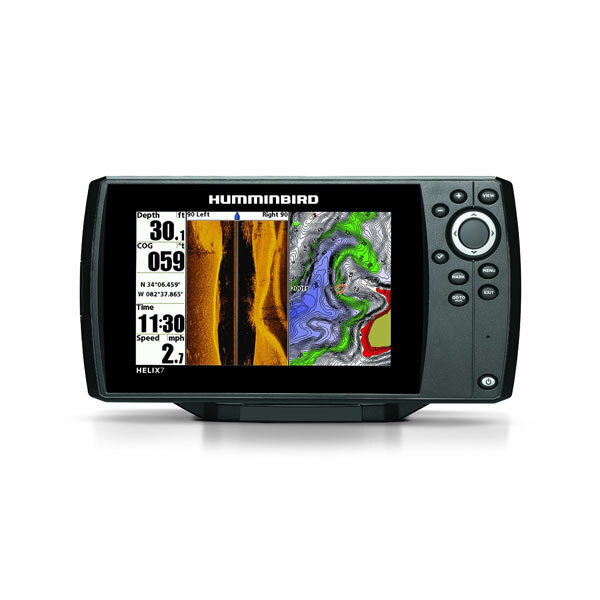 The Humminbird HELIX 7 SI GPS is a medium unit, for a medium price. It offers great fish finding and navigation features. It offers several upgrade possibilities supporting various superior maps, other transducers, its software being also upgradable. Even though it doesn’t support CHIRP sonar, this unit does have Side Imaging and Down Imaging, which makes it a pretty much capable fish finder. Well… the HELIX 7 units, don’t actually have a NMEA 0183 port. But they do have a COM(munications) port (see here: http://fishfindersadvisor.com/wp-content/uploads/2016/08/helix-7-communications-port.jpg), port that is used for factory testing, but it can also be used for NMEA 0183 Output. When it comes to VHF, this unit can be connected to a VHF radio, and for that you will need the data cable AS HHGPS. Does the Helix 7 with SI GPS come with the Flasher mode ? Yes, it has the Flasher Mode. Can you use the same transducer the helex7 si gps comes with in the ice fishing mode ? 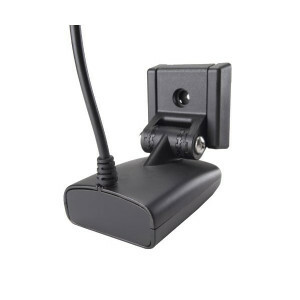 The standard included transducer for the Humminbird HELIX 7 SI GPS is the XNT 9 SI 180 T model. You can find it here.